If you want people to take action (buy your products, sign up for your newsletter, or share your content), you must make your web visitors painfully aware what you want them to do. That means, if you want someone to sign up for your newsletter, they first need to SEE your opt-in form. You may think it’s painfully obvious, but assume nothing. Just because you think it’s obvious, doesn’t mean a new visitor who stumbled on your website will think the same. (Remember that survey we ran a few weeks ago? There were people who had no idea that DIYthemes sold the premium theme framework Thesis. Heh). So, the question is, how can you alert your new visitors about what you want them to do? That’s where “Line of Sight” comes into play. I’ve wrote about this before (in the free ebook Nonverbal Website Intelligence and how images improve or destroy conversion rates), but I’ll say it again: Following someone’s gaze is irresistible. Plus, later in this article, I’ve stumbled on some new research from Italy that I’ve never talked about before. You’ll love it. Imagine you’re walking down an empty city block and you spot someone curiously looking up at the sky. Would you quickly glance up to see what has their attention? Absolutely! Now you’re wondering, what does this have to do with websites? Let’s say you’re going to use a picture of a person on your website. Keeping line of sight in mind, you should direct their gaze the direction where you want your visitors to look. Guess what happens? People will follow the gaze of the person in the picture because a human gaze is like a big red arrow pointing in a specific direction. As you can see, her eyes are pointing directly towards the opt-in form. It’s hard to miss. While I don’t have the data from Chemistry, I’m betting it does. They’ve used that exact image for YEARS. But how powerful is “Line of Sight” really? Giovanni put together a group of research experiment participants, and told them to look out for a small target that would appear on a screen. The target would appear either on the left-hand side or the right-hand side, and when it appeared, the participants had one main goal: press the spacebar key as fast as possible. Then, to make things even easier, a word “Left” or “Right” would appear in the middle of the screen… right before the target appeared. This word told people exactly where the target would appear, with 100% accuracy. The reason why they did this was because they didn’t want people “struggling” to find what side the target appeared on. But, as always with research experiments, there was a catch. After the direction word appeared, but before the target appeared, either a cartoon face or an arrow would appear, and they could be looking in either direction… either towards or away from where the target was about to appear. (The arrow can point, naturally. With regards to the cartoon, the line of sight of the cartoon character would point either towards or away). So, how fast did people press that space bar button? Every time the arrow and face looked away from the target, it took people longer to press the space bar. It was only a few milliseconds, but the change was statistically significant. What’s funny is this: people were told to ignore these faces and arrows, and they couldn’t. Following them was irresistible, and that’s why it took people longer to press the space bar. Instead of looking out for the target, they wasted time looking at the wrong side of the screen. 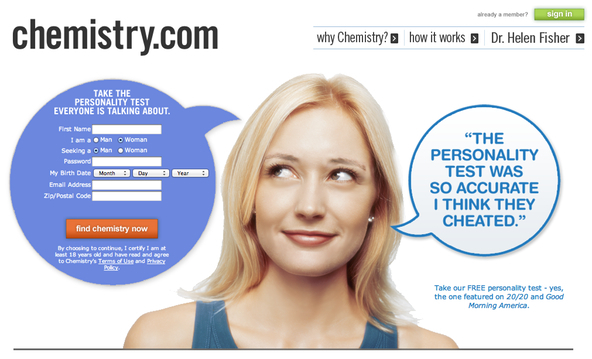 First, I told you about that class Chemistry.com example. Then I shared some interesting new research about the power of line of sight and arrows. They’re people just like you, just like me, and just like people in that experiment. And as I said earlier in this article, just because something is painfully obvious to you, doesn’t mean it’s painfully obvious to your visitors. But based on this new research, it seems that an arrow or picture with someone looking at your desired action is an easy way to make sure it IS painfully obvious. And what happens when your desired action becomes painfully obvious? So, the question is, are you going to work some classy arrows or “line of sight” into your blog design?